The photo above is actually from a BLT season past, when all sorts of gorgeous heirloom tomatoes were in full swing in the garden. Despite having 21 tomato plants in the ground this year, the pickings have been so slim that we actually had to keep postponing BLT opening night. When we did finally sit down to dinner (three hours later than planned), I was too hungry to stop for a photo shoot. The pink Arkansas Travelers are starting to ripen, though, and I have high hopes for a least a couple more BLT dinners in our near future. This hardy heirloom, which is heat and humidity tolerant as well as crack and disease resistant, is one of my favorites and usually performs really well in my garden. You can read about more of my (and your) favorite varieties of heirloom tomatoes to grow here. 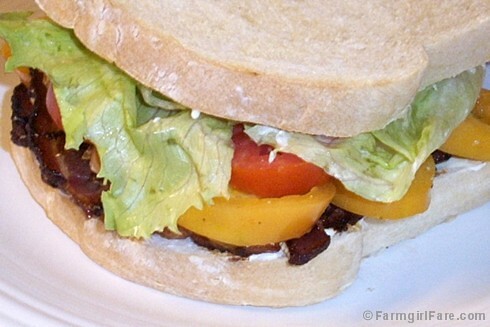 No matter what kind of tomatoes go on our BLTs, the bread is always the same: freshly baked Farmhouse White. 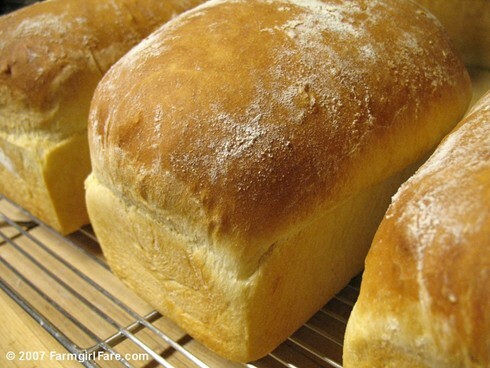 This simple, traditional loaf is one of my most popular recipes. It's made with milk rather than water (though water works, too) and is nice and soft, but not too soft. It's great for just about any kind of sandwich and brings peanut butter and jelly, a staple around here, to a whole new level. It's wonderful toasted, smells heavenly while toasting, and makes an awesome BLT. If you're been longing to learn how to bake your own sandwich bread (and isn't BLT season the perfect time to finally do it? ), my easy Farmhouse White is the perfect place to start, and the recipe includes detailed instructions for beginners. There are also lots of bread baking tips here and here. I've been baking this bread for 11 years and have watched plenty of people who claim they never eat white bread gobble slices up. Once you master the basic formula, you can add all sorts of other things to the dough if you like, such as several cups of whole wheat flour or some oat bran and a touch of honey. What goes well with garden goodness? Homemade bread! © FarmgirlFare.com, celebrating summer one hard won homegrown tomato at a time. I like BLTs all year round, but you are right that at this time of year they are the best. Just had a look at your kitchen with the three sinks! I covet those sinks. I want to get two really deep sinks in my house to hide all the dishes I don't want to deal with right away. MMMM. BLTs are a favorite of mine also. I'm glad to say that I had some early tomatoes this year and have been scarfing down BLTs breakfast lunch and dinner. Sometimes I put peanut butter on one slice of the bread and mayo on the other, and add some thin slices of sharp cheese...sounds weird but it's quite good. Your Farmhouse White looks scrumptious. I will try your recipe the next time I bake bread. Thanks for all the food and gardening inspiration! Did you ever hear of a book called "Letters of a Woman Homesteader"? They are, as you might guess, a compilation of letters from a woman who filed a claim in Wyoming in 1909. She had a pretty hard life, as you might imagine, and worked incredibly hard at gardening, taking care of cattle, cooking on a woodstove, etc. And then, on her rare days off, what did she choose to do? She went camping! Craziness. You should read the book though, if you haven't yet. I think you'd like it. I'm getting quite a few tomatoes, too. I was mainly going to use them for salsa but I think BLT's sound wonderful. I love making bread, though these days I let the bread-making machine take the strain of kneading. As bread of one kind or another is a vital staple food in every culture both now and through history - making it makes me feel connected somehow to all those other bakers - it's 'grounding', if you know what I mean and if I'm making any sense! Looking forward to trying your recipes in the links above. Looks delicious! Making your own sandwich is always the best. I love the satisfaction it offers knowing that I am the one who made the effort to create it. I'm salivating just looking at your photo. I'm in Florida so my second round of tomatoes aren't ready yet. Thank you for the inspiration! I am glad that you are finally getting some tomatoes in! Like you, I had an abundance of plants but have not been reaping very many rewards. I blame Missouri weather. And Hornworms. I might have to try out that variety next year! Thanks for mentioning it. Half a year to go! We LOVE tomato season.